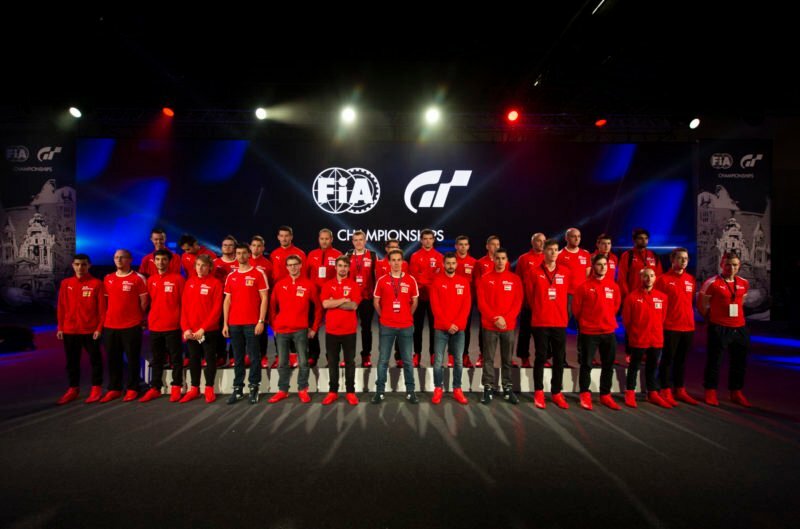 Another ten players have booked their places in the GT Sport Nations Cup final next month, with Germany’s Mikail Hizal (TRL_LIGHTNING) leading the way. 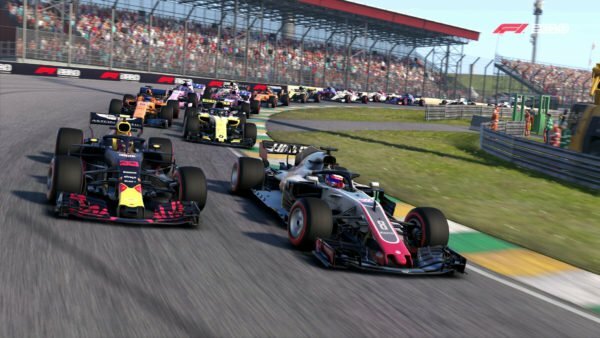 Hizal took the title after two days of racing in the impressive venue at Madrid Games Week. 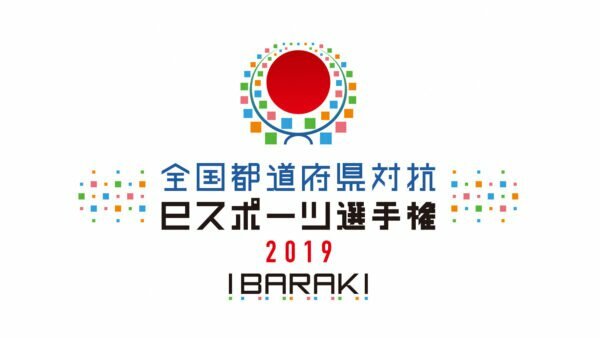 An initial round of qualifying races pared the field down from the top 30 drivers to just ten — all of whom will represent their nations at the world final in November. These ten then went head-to-head in order to determine the best of the best. A seeding system placed the drivers into three theoretically equal groups based on their Final Round rankings. Each group then raced Gr.3 cars, with the top two in each race qualifying straight to the second day and the world finals, while the bottom two would be eliminated. The racers in 3rd to 8th would have a second chance in two repechage races. A fluke of the seeding system placed all three of the UK’s representatives in block A for the race at Circuit de Sainte-Croix A. 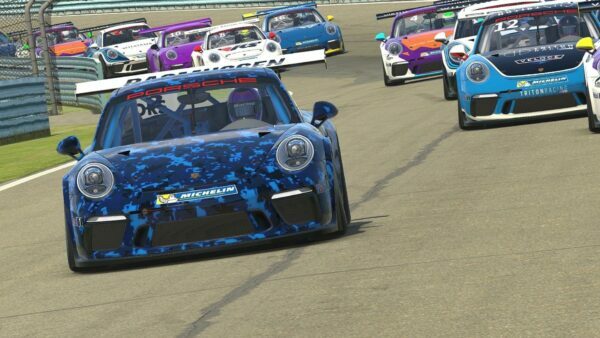 Two of them — Suswillo (GTP_Aderrrm) and Grady (GTA_Tidgney) — qualified their cars on the front row and started to streak ahead on the soft tires. Suswillo’s advantage didn’t last long however, as an error in turn three spat him out onto the grass. As he rejoined, his Toyota FT-1 came into contact with the BMW M6 of third-place man Mangano (Giorgio_57). The two cars traded paint through turn four, with Suswillo coming out ahead — albeit with a warning from the stewards — and Mangano slipping behind Bader (Benito-Raul) as a result. As Mangano tried to regain his place, a further collision — with Bader’s Hyundai — saw him slip further behind, as both Cherpion (Wind-Steve14) and Adamczyk (TX3_Popsu) made their way past onto the suspension bridge. With the Brits scampering away on stickier tires, Mangano was trying to make up lost ground. He too was nursing a warning after the contact with Bader, but sent one up the inside of Cherpion braking into turn two to take back fourth. Third came half a lap later, with a move four corners in the making — eventually clinched onto the bridge. At the head of the pack, Grady and Suswillo dived into the pits to shuck the worn soft tires, but split their strategies. Leader Grady opted for the hard compound while Suswillo went for the mediums. Behind them the whole field bar Bader and Zjawiony (SRC_Rejfix) followed suit. Most swapped hard for medium or vice versa, with only Könönen (maatu79) going for softs. A big winner in the pitstop window was the third Brit, Klasic (RC_Zoky88). As Bader and Zjawiony made their stops, Klasic leapt up the order to fourth, just behind Mangano. Tumbling in the other direction was Cherpion. As the cars approached the end of lap four, Suswillo moved back into the race lead, sliding past Grady through the final turn. Mangano in third opted to pit for new soft tires for the final two laps, putting Klasic up into third for a UK 1-2-3. On the softest tire though, Mangano was tearing up the field. He turned the three second deficit to Klasic into a three second advantage by the end of the lap. The two leaders made their own last pit stop, hoping to only drive one lap on their least favorite rubber, and came out to find the Italian right on their tail. However, Mangano couldn’t find a way past Grady’s Volkswagen, despite getting close a few times; a little too close once, resulting in another warning for contact. At the line the three drivers were just 1.5 seconds apart, with Suswillo and Grady qualifying and Mangano heading for the repechage. Zjawiony and Cherpion were the unlucky drivers heading home. The next race was on the more familiar territory of Brands Hatch, with one of the firm pre-tournament favorites, Patrik Blazsan (TRL_Fulvaros) starting on pole in the Porsche 911 RSR. Blazsan opted for the medium compounds while just behind him Collin (MathieuCollin) and Duval (RC_Atho) were starting on the soft tires. Despite the tire disadvantage, Blazsan was able to keep the Beetle and WRX behind him in the opening stages. Further back in the field, Grasso (garasa-91) and Tapai (TX3_Adam18) came together at Westfield. The stewards deemed Grasso at fault and hit him with a five-second penalty, but for Tapai — who’d ended up facing the wrong way in the gravel trap — his weekend was over within a minute of the race start. At the front, Duval and Collin weren’t getting any joy in passing Blazsan, who’d managed to eke out a small lead as the duo dueled. Dolinsky (LorD-ProtectoR99), who’d made his way up to 4th also on the soft tire, ducked into the pits at the end of lap 3. That hinted that Duval and Collin would follow on the next lap, and they duly did. 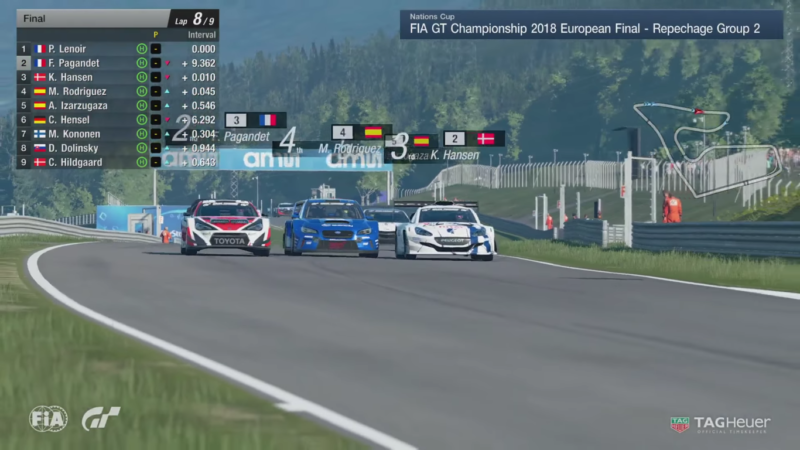 This gave Blazsan room to breathe with an eight-second advantage over the now-second place runner Hansen (Kenni3390) in the Peugeot RCZ. To make matters worse for Duval and Collin, they emerged in traffic, between Hansen, Cordeiro (JIM_Azorean_Fat) and Salazar (pcm_stj). 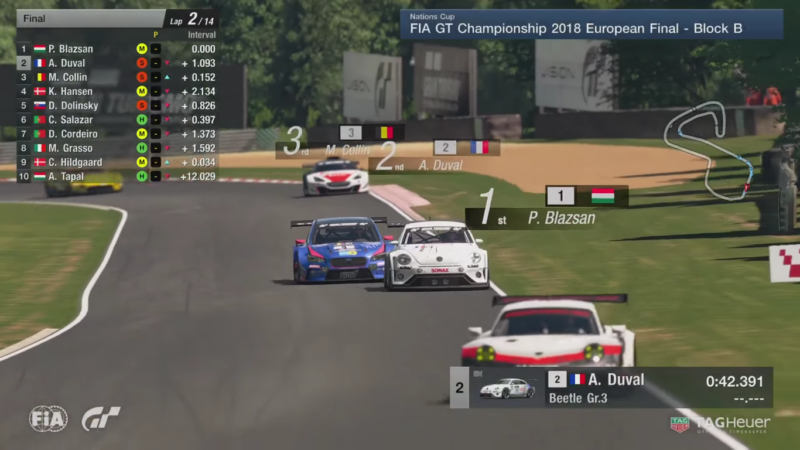 With his rivals losing time in the pack, Blazsan was able to pit from the lead and retain it as he left. Other stops released Collin and Duval, but Blazsan had a two-second lead and was now on the softest tire. Sure enough, he made the most of the advantage and soon stretched out that lead to nine seconds. The race had settled down by the mid-point, with gaps developing between the cars on different strategies. Duval and Collin were still eager to share the same path of asphalt though, at least until Duval made his second stop on lap nine. Blazsan was next in, but with a ten-second gap he could get in and out without losing a position as he went onto the hard tires. Collin followed him in though, and came out in third; Duval had made the new tires count when it mattered and pulled more than two seconds ahead. With the Hungarian driver out of sight, second was still on the line. Collin’s younger tires meant he could cut down the gap to Duval ahead, but in the end he didn’t quite have enough time to achieve it. That put Blazsan and Duval through to the finals, while Tapai, who’d made a great recovery, would leave along with Cordeiro. 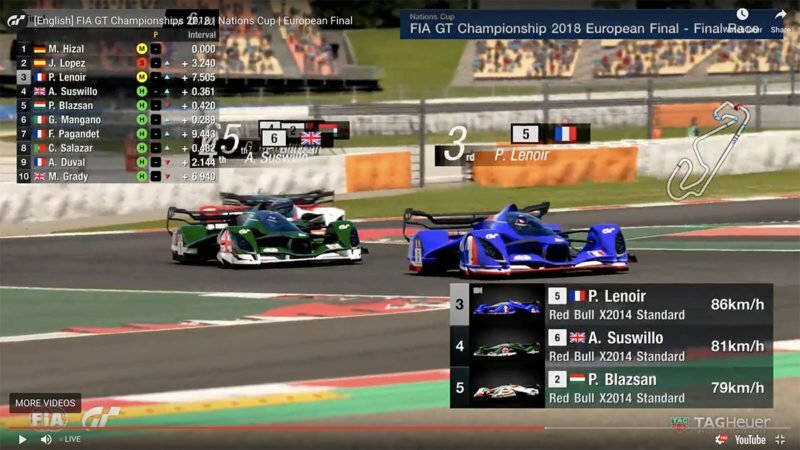 Another strange artefact of the seeding system saw all three Spanish drivers taking part in block C. For further similarity with the block A race, one of the three was on pole — Lopez (Williams_Coque14) — and the location was another of GT Sport‘s original circuits: Lago Maggiore. For a brief moment we thought the race was a replay. Lopez braked too late for the tight first turn and ran out of road. 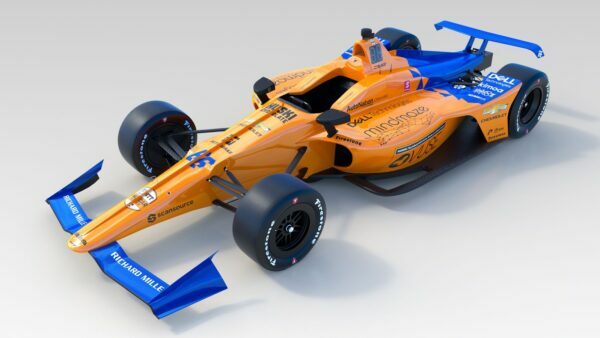 This allowed second-place Hizal (TRL_LIGHTNING) to run up alongside and the two swapped a little paint until Lopez made the grip advantage of the soft tires work. Soon Lopez, Hizal and Pagandet (Jomas_74) were moving away from the chasing pack, using their softer tires — Lopez on soft, Hizal and Pagandet on mediums — to build a solid lead. With the tires waning though, Lopez soon had to pit and came out between countrymen Rodríguez (TRL_MANURODRY) and Izarzugaza (Alexony94). When Hizal and Pagandet pitted a lap later, Lopez had managed to work his new medium tires into a five-second lead. It was closer further back, with Lenoir (RC_Snake91) and Rodriguez joining in a four-way fight for second place. 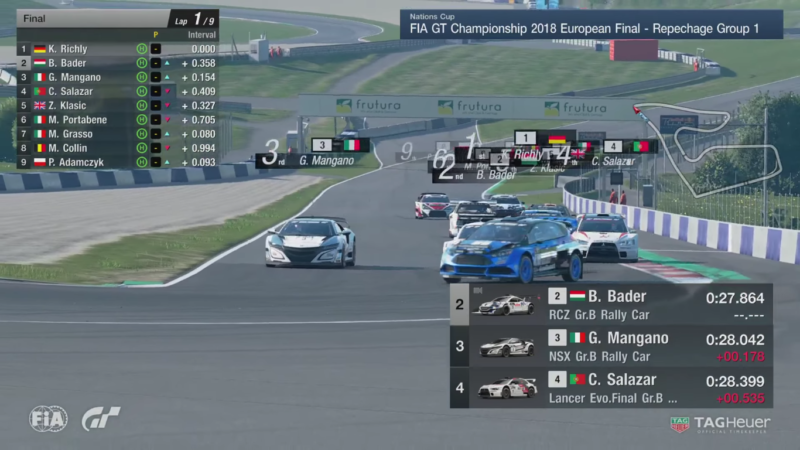 The battle for elimination was no less tight as Izarzugaza, Portabene (Endless_GTExD) and Hensel (VP_RaceFace) all tried to avoid the dreaded ninth place, although Davids (GT_BOCA_SINZU) had dropped off the back of the pack in tenth. The next major shake-up came on lap 7. The lead trio all pitted for new tires at the same time — Lopez moving to the hards and Hizal and Pagandet onto the softs. That promoted Rodriguez into the lead, and he ended up inadvertently delaying his countryman Lopez for the best part of half a lap. Lopez eventually managed to sling past into Maggiore’s feature banked hairpin, but a five-second lead was now only just two. That became one as Hizal closed in on the back of Lopez through the last lap, but in the end the Spaniard held on for the win, to the delight of the home crowd. Hizal kept second and also qualified. Davids and Austrian Nussbaumer (nussini95) — who’d had a torrid final stint on hard tires — filled the elimination spots. 18 drivers still had a chance to qualify, by finishing in the top two in the two repechage races. 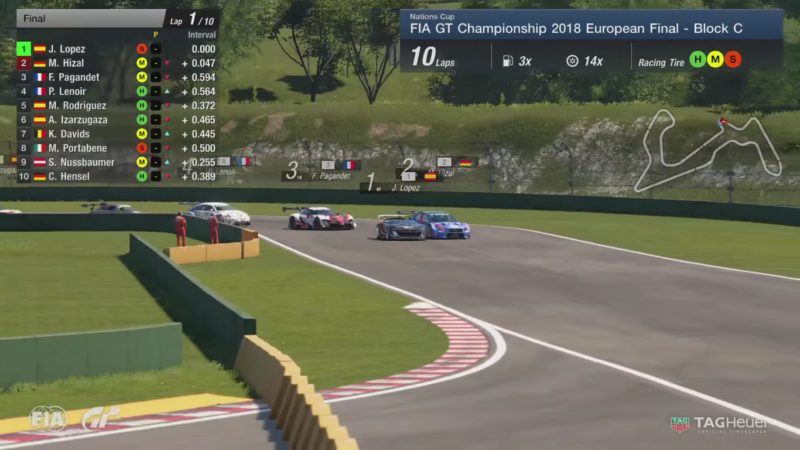 These had an identical format: a nine-lap race of Red Bull Ring in GT Sport‘s Gr.B rally cars. A rather frantic start saw Mangano make a very successful lunge up the inside at Remus, taking second place from Bader, with Salazar following him through with better drive off the bend. On the run down to Schlossgold it became a three-wide battle as Klasic joined the fray in the WRX. Pole-sitter Richly (VP_Bellof956) had managed to stay clear of the fight behind him, but soon Mangano had reeled him in — and dragged the three other cars along with him. By halfway, the front five had a four-second advantage, but were only covered by under a second themselves. Mangano made his first real attempt into the last corner of lap four. Running up the inside of Richly’s Focus, Mangano managed to keep the NSX stuck on its line. Klasic followed in his tire tracks and Richly was forced wide. Richly switched lines and repaid Mangano the favor, resulting in the cars running up the hill after turn one four-wide. Klasic took the lead momentarily, but Bader came back in the RCZ. Richly then retook the lead, with Mangano following through as both Bader and Klasic caught the gravel on the corner exit — dropping Klasic off the lead group. By this point the podium positions were changing practically every corner. Salazar seemed to have dropped off from the lead trio after having to serve a minor track limits penalty, but soon he was back in the mix as Richly went from leading to fourth in the space of a single lap. The checkered flag had to come eventually, with Mangano seeing it first and followed home by Salazar, just a quarter of a second ahead of Bader. The opening stages of the other repechage race were far calmer. Lenoir started on pole — also in the Focus — but managed to establish a pretty healthy two-second lead by the end of the second lap. Again though, a front five soon established itself, with Hansen, Pagandet, Rodriguez and Izarzugaza all vying for the second spot. Pagandet managed to get the Toyota GT86 to the lead of that group, passing Hansen into Schlossgold. Home favorite Rodriguez soon followed him through and set up a tussle that would last for much of the rest of the race. Rodriguez took the position braking into Remus, with Hansen capitalizing on the gap too. Pagandet came back down the hill and slid back into third into Rauch. On the following lap, Pagandet made it back up into second with a two corner-long overtake. Rodriguez couldn’t turn in, and Hansen followed Pagandet past the Spaniard. It was a role reversal on the next lap. With Pagandet on the inside and Hansen on the outside, Rodriguez braked in the middle of the track and slotted past them both. All of these overtakes also allowed Izarzugaza to rejoin the fight, having dropped away a little in the middle of the race. Some paint-trading through the second sector saw Rodriguez drop to fifth, while Hansen took the second-place hotseat. Half a lap later, Rodriguez repeated the middle-of-the-track braking maneuver, but this time Pagandet was able to defend and he took second again. That proved to be the move that finally stuck. With Rodriguez, Hansen and Izarzugaza all in each other’s airspace, Pagandet managed to draw out a small gap. While Lenoir took the flag by more than eight seconds, countryman Pagandet followed him home. This result meant that all three French drivers qualify for the World Final. Before the day two action could get underway, the drivers had to choose their cars. Unlike the Asian final, this was by way of a lucky dip draw. 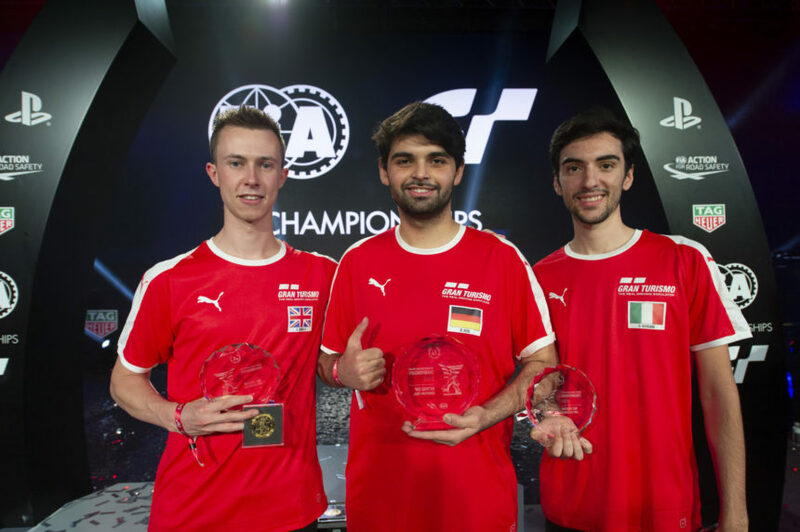 With the cars decided, the drivers then qualified at the Alsace circuit, with Hizal in the McLaren F1 — heavily detuned to fit the N500 class — on pole by nearly half a second. 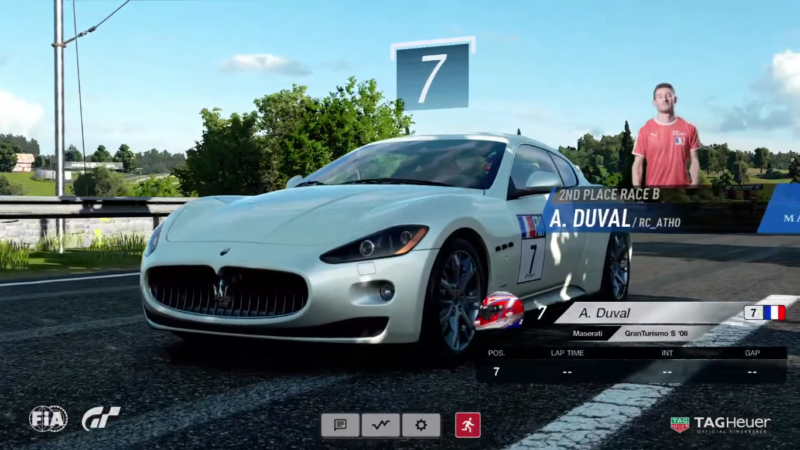 Behind him sat Blazsan in the four-wheel drive Audi R8, and the race also saw the game debut of the Maserati Gran Turismo S, in the hands of Duval. It didn’t take long for the action to start. While Hizal was largely unhindered, Grady in the Ferrari 458 made himself large in Blazsan’s mirrors. On the way out of the hairpin, Mangano got better traction in the M4 and put himself up ahead of Grady on the inside of the sweeping uphill corner. Grady got the place back braking into the tight right, and Mangano left himself vulnerable to Lenoir’s DB11. That brought Suswillo up onto Mangano’s rear bumper — the two drivers who’d had such a scrap early on Friday. Almost immediately Mangano dropped the M4 in the tricky, tightening radius left at the end of the second sector. That saw him drop to tenth and surely out of contention. The order settled down somewhat for the second lap, although approaching the end of the lap Pagandet had an incident in the tricky final uphill left and dropped to the back of the field. That promoted Mangano, who’d already passed Lopez’s F-Type, to 8th. Blazsan meanwhile seemed to be struggling with understeer, and Grady took his position at the start of lap three. Blazsan was the first of the drivers to make his stop, just before halfway. Lenoir, Suswillo and Pagandet followed, hoping to make the new tires work for a quick out lap and gain track position. As expected the rest of the pack pitted on the following lap, with Hizal able to get in and out still in first. Grady, however, ended up behind Blazsan again, as well as Lenoir and countryman Suswillo — and a recovering Mangano just a second further back. The race rapidly became the Mangano show. First he picked off Grady in the first sector of lap six. 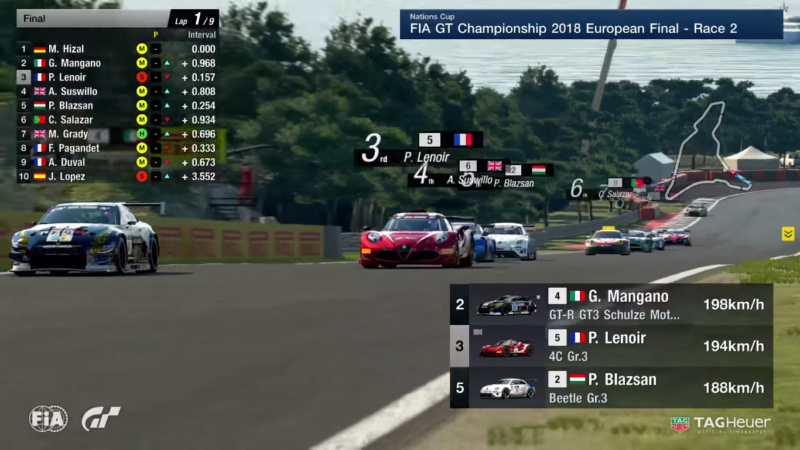 He went for Suswillo in the same place on the final lap but ended up blocked by Blazsan on worn rubber as Lenoir passed the Hungarian driver for second. Suswillo’s reprieve was temporary, as Mangano passed him in the next sweeping left corner — the same one he crashed at on the first lap. Now in fourth he had Blazsan in his sights, but the four-lap old rubber was no match for the BMW. Incredibly, Mangano managed to draw level with Lenoir approaching the final uphill left, and Blazsan hadn’t given up. 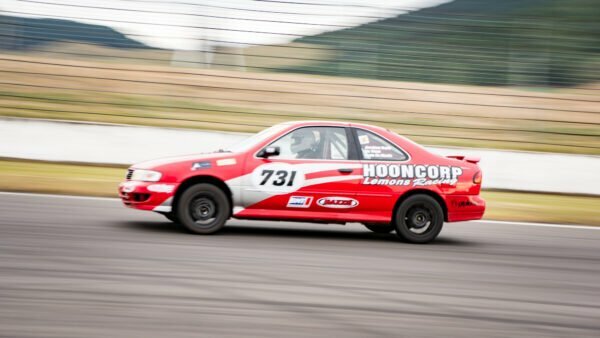 The trio approached the hardest braking zone on the track — downhill into the tightest corner, with tires at their most worn — three wide, and Mangano emerged at the front. While Hizal took the win by more than ten seconds, Mangano ended up second from Lenoir. There was still time for drama. With almost all the other cars covered by a piece of A4 paper Grady, who could have been on the podium moments earlier, dropped the Ferrari leaving the final chicane and plummeted to ninth. The drivers had also drawn their Gr.3 cars for the tricky reverse layout of Dragon Trail Seaside by the same lottery the previous night. However the grid order was the finishing order of the previous race, putting Hizal on pole again, from Mangano. The race also had an unusual rule: the regulations made all three tire compounds available, but only required drivers to use at least two of them. Again, the drama was on the opening lap. Lopez in the AMG GT and Duval in the FT-1 banged doors coming out of the first hairpin, with Lopez coming off worse. That saw the second steward-issued penalty of the weekend, as race control slapped Duval with a two second fine. Meanwhile his countryman Lenoir was making ground in the Alfa Romeo 4C. Lenoir was the only one of the front-runners using soft tires from them start, and made them work in Dragon Trail’s tight hairpin. Further back, Salazar sent the 911 past Blazsan’s Beetle in the final chicane, but as Blazsan got back past on the straight Grady — the only driver on hard tires — powered past in the Aston Martin. This was when the strategies started playing their part. Lenoir and Lopez, the soft runners, pitted but split their strategy to hard and medium respectively. Meanwhile Pagandet was the first driver on mediums to blink and came out on hard tire too. Lap 4 provided a little breather, with drivers holding station and no-one opting to pit. Indeed it was the front-runners — Hizal and Mangano — who ducked in next, at the end of lap 5 and both choosing the soft tire for the final four laps. Given that the softs had only lasted three laps from the start, that seemed like a brave choice, but Blazsan and Duval followed suit. Suswillo inherited the lead as he stayed out for yet another lap, with Grady behind on the hard tires. Meanwhile Hizal and Mangano came out behind Lenoir who’d pitted much earlier, putting him in the effective lead. It didn’t stay that way for long; new soft tires against Lenoir’s older, harder rubber meant both went past before the end of the lap. With Suswillo, Grady and Salazar pitting, normal order resumed. Lenoir’s hard tires made him something of a sitting duck for Blazsan going into lap 8, with Suswillo making the same move half a lap later. Salazar had an off-camera incident as Pagandet passed into the first braking zone, and dropped to more than 20 seconds off the back of the field. With the final lap well underway, Suswillo took the podium away from Blazsan. The Hungarian’s unusual wide line into the second hairpin saw him brush the dusty apron, leaving the door wide open for Suswillo on one-lap younger tires. Despite closing the gap towards the end, Mangano wasn’t able to pass Hizal and so the top two were as they were at the start of the race, with Suswillo in third, ahead of Blazsan and Lenoir. That set up an effective five-way battle for the title, with Hizal, Mangano, Suswillo, Blazsan and Lenoir all with a reasonable shot in the final one-make race. 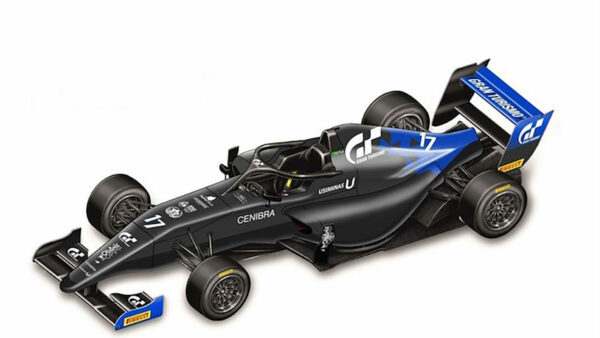 This used the X2014 concept car, decorated in national colors, at the new Circuit de Barcelona-Catalunya. Unlike the rest of the final ten, Lopez opted to start on the soft tire. The hard tire was the choice for many, and that proved to be an immediate error; with a first gear rolling start at near enough 60mph, the hard tire didn’t have the traction for a clean getaway in the 900hp X2014. Mangano suffered particularly with serious power-on oversteer, with Suswillo passing almost before the start line. Bad went to worse as Blazsan and Lenoir both passed the Italian before the first corner and soft-runner Lopez made it four with a pass under braking. 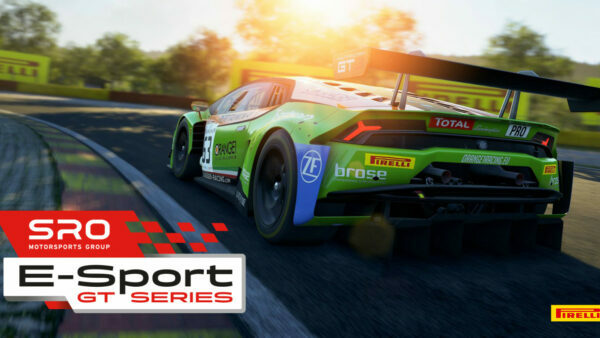 With a major tire advantage Lopez leapt up to third before the end of the lap, passing Lenoir around the outside and springing past Blazsan after a better run through the final chicane and corner — to the great delight of the home crowd. After a battle lasting most of lap 2, Lopez got past Suswillo, with Blazsan able to follow through and get back into a podium place. Lenoir, on softer tires than Suswillo, also took a place midway through lap 3. As Lopez chased down Hizal, Lenoir made his own tire advantage count and passed Blazsan for third. But then came a minor disaster for Lopez; the Spaniard took too much kerb in the chicane and the X2014 whipped around. Fortunately he ended up doing a complete 360 and was able to resume with only four seconds lost, but he had to catch up with Hizal all over again. Lap 6 saw perhaps the move of the race. Suswillo found himself up in fourth behind Blazsan, sold the dummy and passed under braking into La Caixa. Meanwhile Lenoir took an almost impossible gap on the inside of the Hungarian and passed both drivers at once. The trio were still trading places through lap 7 as the tires were approaching the end of their useful lives. Lopez was the first to pit, swapping the soft tires for mediums and coming out to a clear track in fifth. Suswillo ran wide into the Repsol corner, allowing Blazsan past and up into second. That put the Brit on the same patch of road as long-time sparring partner Mangano, and sure enough an incident followed. The two had a bit of contact braking for turn five, with a visibly annoyed Suswillo running wide on corner exit and spinning. Up front Hizal took a pit stop onto the hard tires. This brought him out just behind Blazsan and Mangano, while Lopez on the mediums caught and passed the recovering Suswillo. Blazsan pitted shortly after, but Mangano opted to stay out for a tenth lap. This allowed Hizal to catch up, but the slower Mangano on ancient rubber backed the German into Lopez. When Hizal did manage to pass, Lopez followed him through. Then the move came. Lopez used the mediums to full effect and passed Hizal for the lead into turn one. Hizal, who still had the soft tires to come at the end of the race, wisely chose not to make it too much of a fight, but kept in Lopez’s tire tracks — and slipstream. Meanwhile it was all going horribly wrong for Blazsan. Getting offline in turn five, the Hungarian span the X2014 and ended up in the wall. This dropped him to ninth, and out of the picture. Over the next few laps, Hizal began to harry Lopez. Although not able to make a move stick, Hizal forced Lopez to defend and wear down his softer, medium compound tires. Eventually, on lap 15, he got the lead back with Lopez not having enough tire left to hold him off. The two both pitted together at the end of the lap. That gave Hizal a two-compound advantage for the final five laps, and he soon made it pay. From a nose-to-tail pit entry, Hizal dropped Lopez by more than three seconds in the first lap. With only a 13-second lead over the third place car and the entire rest of the grid on softs, Lopez might have been more than a little concerned. Just behind him, Suswillo — who’d stopped one lap later than everyone else, so had fresher tires — made his way past Pagandet into third. Despite making up more than three seconds on the final lap though, the Brit couldn’t catch Lopez, and had to settle fir third. With three wins from three, Hizal comfortably won the title, with Suswillo and Mangano in second and third.